In less than three decades, Nokia emerged from Finland to lead the mobile phone revolution. It grew to have one of the most recognizable and valuable brands in the world and then fell into decline, leading to the sale of its mobile phone business to Microsoft. 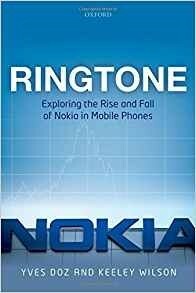 This book explores and analyzes that journey and distils observations and learning points for anyone keen to understand what drove Nokia's amazing success and sudden downfall. With privileged access to Nokia's senior managers over the last twenty years followed by a more concerted research agenda from 2015, the authors describe and analyze, the various stages in Nokia's journey. The book describes leaders making strategic and organizational decisions, their behavior and interactions, and how they succeeded and failed to inspire and engage their employees. Perhaps most intriguingly, it opens the proverbial 'black box' of why and how things actually happen at the top of organizations. Why did things fall apart? To what extent were avoidable mistakes made? Did the world around Nokia change too fast for it to adapt? And, did Nokia's success contain the seeds of its failure?